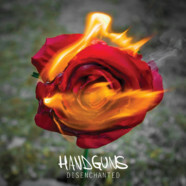 Just a year after they brought us Life Lessons, Pittsburgh natives Handguns expanded their discography to include Disenchanted in November of 2015. Familiar with the Vans Warped Tour scene, Handguns still serve their pop punk origins well, bringing forward a consistent style despite at 100% lineup change. The title of their first full-length, Angst, really seemed to set the tone for the rest of their work. It’s the kind of catchy aggression we all expect and love from the pop punk scene, with vocals straight out of Warped. While Handguns could perhaps be at risk of being indistinguishable from the rest of their genre, they’re certainly tapping into what’s popular effectively. Handguns bring a strange, contradictory energy to the table: It’s simultaneously emo and lively, defeatist and defiant, adamant and uncertain. The melodies skip around like crazy (almost like their lineup). It would likely be off-putting if it weren’t so catchy, but luckily, that’s only a hypothetical for Disenchanted. Vocalist Taylor Eby sounds ALMOST as angsty as his lyrics; He gives us all the melancholy, rage, relief, sentimentality, confidence, and resentment we could ask for. While there’s a definite cohesive sound to the album, there’s a more than adequate range of lyrics, from frustration with the media, to change, to wonderful relationships, to terrible ones. Some lines do hopscotch on that line of turning corny, but the intention behind them is so genuine, they’re very much excusable. Depending on how you look at it, a positive/negative of Disenchanted is that it really doesn’t show much change in direction from album-to-album. But, as Eby so eloquently tells us in “Carbon Copy Elitist,” “[he] doesn’t want to talk about all your favorite records, and [he doesn’t] really care about what bands you think are better.” So if you’ve been in love with Handguns’ sound since Day 1 but you’ve had their other releases on repeat for too long, you’ll be in love with this one. While of course there’s something to be said for evolving your sound, mixing things up, and experimenting, there’s also something to be said for not ‘fixing something when it ain’t broke.’ These guys have found something that works for them no matter who they’re playing with, which really is admirable. With addictive melodies and insane riffs, Disenchanted has us anything but disenchanted.